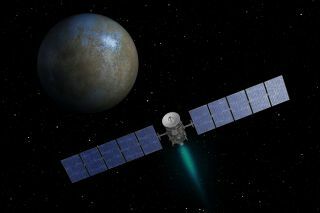 Artist's concept showing NASA's Dawn spacecraft heading toward the dwarf planet Ceres. Dawn has been orbiting Ceres since March 2015. NASA's Dawn probe is staying in its current orbit around the dwarf planet Ceres a bit longer than originally planned while engineers try to figure out why the probe went into a precautionary "safe mode" last week. Just after Dawn fired up its ion engines to begin spiraling down toward its third science orbit of Ceres on June 30, the spacecraft's protective software detected a problem of some sort, NASA officials said. As a result, Dawn quickly shut off its engines and went into safe mode. Mission team members got the probe back up and running over the next two days. Dawn is healthy and out of safe mode, but it's staying put for now. "Dawn will remain at its current orbital altitude until the operations team has completed an analysis of what occurred and has updated the flight plan," NASA officials wrote in a mission update Monday (July 6). The $466 million Dawn mission launched in September 2007 to perform up-close investigations of Vesta and Ceres, the two largest objects in the main asteroid belt beween Mars and Jupiter. Dawn orbited Vesta from July 2011 through September 2012 and arrived at the 590-mile-wide (950 kilometers) Ceres this past March. Dawn is studying Ceres from a quartet of progressively closer-in orbits. The spacecraft currently circles the dwarf planet at a distance of 2,700 miles (4,400 km); the third science orbit lies 900 miles (1,450 km) from Ceres. In its fourth and final mapping orbit, the spacecraft will eye Ceres from just 230 miles (375 km) away. The original plan called for Dawn to attain this orbit in December and stay there through the end of the mission in June 2016.